Prof. Walter Ricciardi, head of the Italian National Institutes of Health; Dr. Mark Tykocinski, provost and executive vice president for academic affairs at Thomas Jefferson University; Dr. Steve Klasko President of Thomas Jefferson University and CEO of Jefferson Health; Franco Anelli Rector of Catholic University; Prof. Rocco Bellantone President of Catholic University medical school. 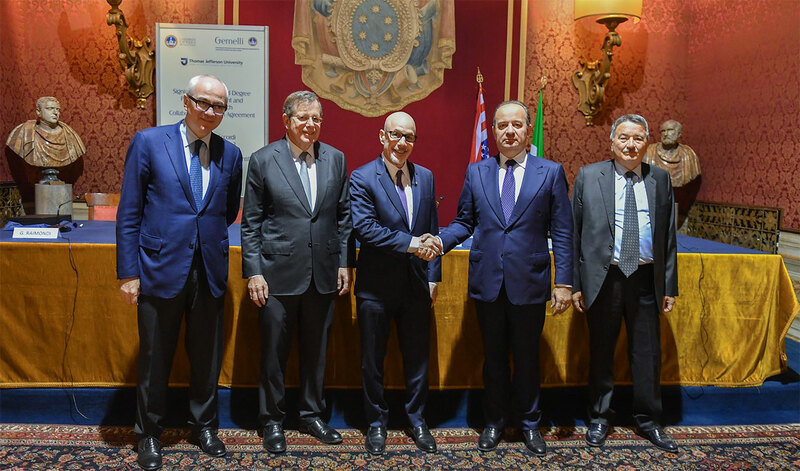 Thomas Jefferson University, in collaboration with prestigious institutions in Italy, signed an agreement yesterday to launch the world’s first-ever dual-medical degree program, enabling a cohort of physicians to practice medicine in both the United States and the European Union. Medical education requirements in Europe and the United States are currently very different. In the U.S., students must earn a four-year undergraduate degree and then a four-year medical degree to practice medicine. Catholic University medical students who select the English track will have the opportunity to travel to Thomas Jefferson University to meet the United States’ undergraduate requirements needed to pursue a medical degree. This option would not be possible had Jefferson not merged with Philadelphia University more than a year ago, according to Mark Tykocinski, MD, provost, executive vice president for academic affairs at Thomas Jefferson University and dean of the Sidney Kimmel Medical College; Jefferson did not offer undergraduate degrees before then.